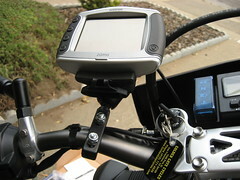 A couple months ago, I blogged about my new Garmin Zumo 550 GPS toy. I decided to wait until my new gel seat came in for my bike before installing the Zumo because I knew that it would be a bit of work to install it and I figured I only needed to undo the bolts once. =) To make a long story short, it is now installed on my bike and I love it. I use it both in the car and on the bike and it is a welcome addition to my geeky arsenal.